Scope and Content Former Phoenix Tubeworks, Dalmarnock Road, Rutherglen, Lanarkshire This was a very large tube works established by James Menzies and Co, who had been wrought-iron tube makers on a smaller scale in Glasgow. Menzies later amalgamated with A and J Stewart and Clydesdale, later Stewarts and Lloyds. This view shows the offices of c1905, unusually elaborate for a heavy industrial establishment, though on the main road from Glasgow to Rutherglen.. The single-storey workshops were behind and to the left of these offices. 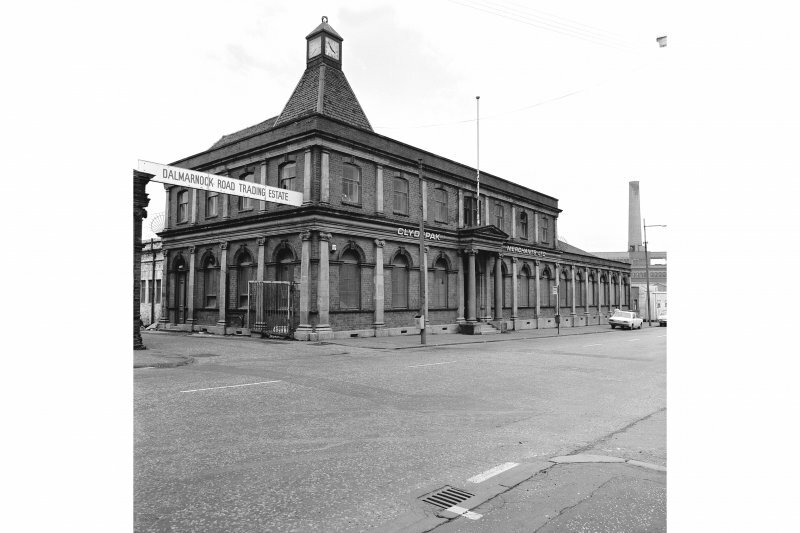 By 1979 much of the works had been converted into the Dalmarnock Road Trading Estate, but part of the workshops were used as a tube warehouse by the British Steel Corporation. Source: RCAHMS contribution to SCRAN.